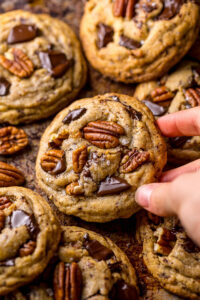 Brown Butter Bourbon Pecan Chocolate Chunk Cookies! Such an incredible flavor combination! Melt butter in a large skillet over medium heat. Add in chopped pecans and cook, stirring occasionally, for 4 to 5 minutes, or until lightly toasted. Set aside until needed. In a large bowl using a handheld electric mixer, or in the bowl of a stand mixer fitted with the paddle attachment, combine browned butter and both sugars and beat on medium-speed until light and fluffy; about 2 minutes. Add in the vanilla and bourbon and beat until combined. Add in the eggs, one at a time, beating for 15 seconds after each addition. Turn mixer off. Using a wooden spoon or sturdy rubber spatula, gently fold in the flour, stirring only until the flour begins to disappear. Fold in the chocolate chunks and buttered pecans. Roll 3 tablespoon sized scoops of dough between your palms to form a ball (they should be big; almost a 1/4 cup), then place on prepared sheets (make sure to leave enough room in between each cookie for inevitable spreading). Continue this process until all the dough has been rolled. Press a pecan on the top of each cookie dough mound, if desired. Place baking sheets in preheated oven, one at a time, and bake for 9 to 10 minutes, or until golden at the edges but still soft in the middle. Repeat with all cookie dough. Sprinkle cookies with sea salt right when they come out of the oven. Let cookies cool for 10 minutes on the baking sheet before transferring to a wire wrack to cool completely.